YOU HOLD IN YOUR HANDS A GREAT SECRET. It has been passed down through the ages, highly coveted, hidden, lost, stolen, and bought for vast sums of money. Fragments of this Great Secret have been found in the oral traditions, in literature, in religions and philosophies throughout the centuries. It has been understood by some of the most prominent people in history: Plato, Galileo, Beethoven, Edison, Carnegie, and Einstein, along with other renowned inventors, theologians, scientists, and great thinkers. For the first time, all the pieces of The Secret come together in an incredible revelation that will be life transforming for all who experience it. 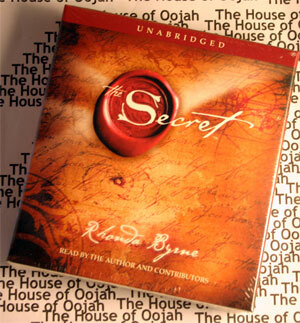 In this audiobook you will discover The Secret . . . and you will learn how to have, do, or be anything you want. You will learn how to use The Secret in every single area of your life. You will hear from modern-day teachers -- men and women who have used The Secret to achieve health, prosperity, relationships and happiness. They share their incredible stories of using The Secret to eradicate disease, acquire massive wealth, overcome obstacles, and achieve what many would regard as impossible. Through them, you will begin to understand the hidden, untapped power that is within you, and the true magnificence that awaits you in life. Make of The Secret One spring day towards the end of 2004, Rhonda Byrne discovered a secret - the secret laws and principles of the universe. Almost immediately her life was transformed, as she began to put into practice what she had learned. It seemed to Rhonda that almost no-one knew the things that she had discovered, even though the concepts could be found in almost every religion and field of human endeavour throughout history. And in that moment her greatest wish, and mission, was to share this knowledge with the world. Rhonda began to see that her entire life - everything she had ever done - had been quietly and steadily moving her towards the most perfect place for her to be able to fulfil her wish. And to fulfil it on the grandest possible scale! She had gone from working as a producer at the Nine Network in Melbourne, Australia, to starting her own television production company, Prime Time Productions, in 1994. And after ten years of creating internationally successful shows such as 'The World's Greatest Commercials', 'Great Escapes', 'Marry Me', and 'Sensing Murder', Rhonda was ready for something new. She wanted to take Prime Time Productions in a different direction; in a direction that fulfilled people rather than just entertained them. Making Of The Secret : Rhonda's JourneyAnd on that spring day in 2004, when a small, old book called The Science of Getting Rich was put into her hands, and Rhonda's whole life suddenly pulled into spectacular focus, she knew exactly what her mission was to become. She was going to take this knowledge to the world. She was going to make a movie to carry joy to every corner of the Earth. And so the great journey that was The Secret began. In early 2005, when The Secret was simply a name and a (momentous) vision, Prime Time Productions was made up of Rhonda, Producer Paul Harrington, and Director Drew Heriot. Paul, who had worked with Rhonda at Prime Time Productions virtually since its beginning, and Drew, who had directed several projects for the company as well, became, with Rhonda, the foundation for The Secret team. One of Rhonda's initial intentions for the creation of the show was that Prime Time Productions would use The Secret to make The Secret... that it would be an effortless, joyful journey as they attracted everything and everyone that was needed to fulfil the vision. And right when the company was ready to begin production, as if by magic, the perfect people to make The Secret began to appear. Making of The Secret Suddenly the office was filled with people, all working to complete the most ambitious project any of them had ever worked on. And without fail, every person required on the team, materialized exactly when they were needed: Glenda Bell, Production Manager extraordinaire, Marc Goldenfein, a talented young Producer and Director, genius editors Damien Corboy and Daniel Kerr, extraordinary graphic artists James Armstrong, Shamus Hoare, Andy Lewis, and Nic George, post production co-ordinator Emma Franz, the youthful and eager production assistants Skye Byrne and Leni Mex, and literally hundreds of others. And without exception, every single person was taught The Secret, and together worked in total joy as they worked for the joy of billions. The day Prime Time Productions arrived in the United States to film the living masters of The Secret, they only had one interview lined up. But they brought with them an entire crew, and the firm intention that they would film every person they needed for the show. And in a matter of a few weeks, the team filmed fifty-two 'teachers' of The Secret. Wherever the team went, more and more amazing teachers would emerge - great writers, leaders, philosophers, doctors, and scientists. These teachers created the foundation for The Secret.